As you might already know, a devastating typhoon struck the central and northern Philippines over the weekend. It brought so much damage to the affected areas and great loss for the relatives of the victims of MV Princess of the Stars tragedy. I was glued on tv last night as I watched TV Patrol giving interviews to the few lucky survivors of the stricken ship. A male survivor recounts the horror they all went through on that fateful day. He said the waves were as huge as buildings, the winds were so strong and the rain was so heavy making everything so dark even if it was still noontime. He also said most of the passengers were in their lifevests but most of them were too scared to jump out into the water and leave the ship. The life rafts were of no use as they were tossed away because of the raging storm. When the captain announced that they'll have to leave the ship, the survivor said in his interview that a lot of passengers especially the children and the old ones were too afraid to do it. While I was watching his interviews, I couldn't help but got teary-eyed. I can imagine the fright that these passengers have been feeling at that moment. My heart cries out for the relatives of the victims. It must have been so hard for them not knowing what happened to their missing loved ones. Sulpicio Lines issued an official statement that they will be giving financial assistance of 200,000 pesos/victim to the relatives. But is there an amount that could compensate to the loss of their families and loved ones? I don't think so. 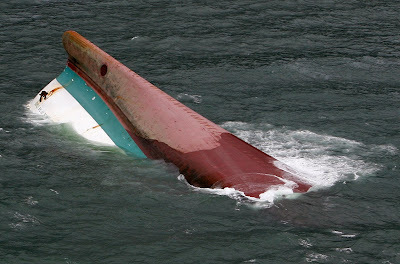 It might be painful to admit but we couldn't put the blame solely to the vessel's management and owners. In the midst of this, there's no point in pointing fingers on whose to blame. No one would want this to happen. As Filipinos, we can offer our sympathy and prayers to our countrymen so that they might get past this terrible life crisis. This is a very harrowing experience for the victims and for all the Filipinos. No words can express the sorrow that engulfed me upon hearing this sad news. The news says that they keep on getting more and more bodies. My sympathies to the families of the victims.